If you spend enough time zipping around town on a bike, you may enjoy the sounds of the city around you, and the sound of the wind whistling past your ears. Have you ever noticed, though, that sometimes that wind noise can block OTHER sounds, like the sounds of approaching cars or other hazards? That was the idea behind the invention of Wind-Blox, a device that helps block some of that excess wind noise and thus improving safety on the road. 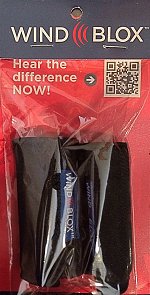 In a nutshell, Wind-Blox are soft fabric “envelopes” that wrap around the front straps of a cycling helmet. The envelopes are filled with a cushy foam and attach with hook-and-loop material. The Wind-Blox serve as a baffle, channeling excess wind noise past the ear. 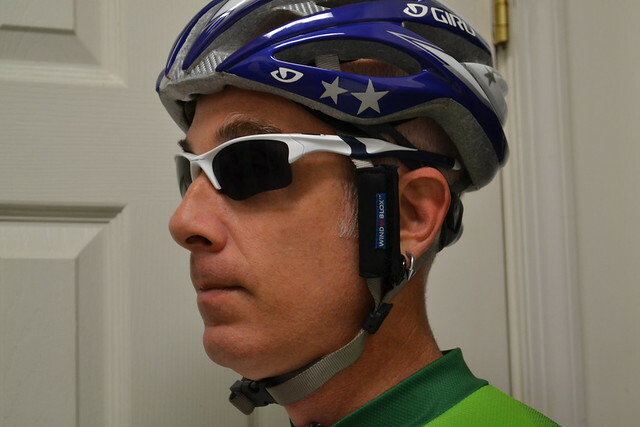 They attach easily in just a few seconds, and are adjustable along the length of the helmet strap by sliding up or down to maximize wind reduction. The material and the construction is soft against the skin and there was no irritation to speak of. While riding around my city, I experienced much the same effect — the “roar” of the wind was lessened, and I felt as if I were able to discern cars approaching sooner and to hear some of the other city sounds that get drowned out by the wind. It seems like a really silly sort of invention, but it does work! The Wind-Blox come in four colors: Black, Silver-Grey, Neon Green, and Pink, and retail for $15.00 right on the Wind-Blox website. They make a lovely stocking stuffer or small everyday gift for the cyclist in your life.